Ricardo Beverly Hills has emerged as a leader in the the luggage industry for creating quality, innovative, yet affordable products. Their promise is quality and performance. 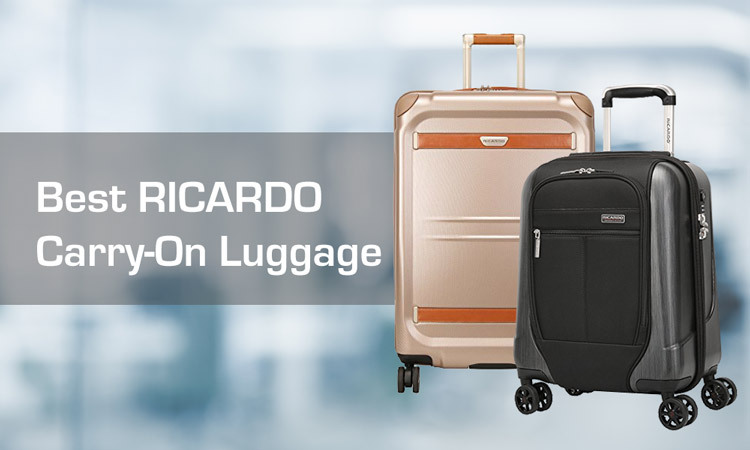 So whatever your travel needs these Ricardo carry-on luggage options are a wise investment. With the great deal of carry-on options offered it can be difficult to choice the right bag for you. So we did you a favor and took out some of the work by providing this list of the best, highest rated carry-ons. So you could spend hours combing through the 200+ options or you can just scroll down and and take a few minutes to read below. We recommend the latter. Cuz we care. This handsome Ricardo Beverly Hills Ocean Drive 21-Inch carry-on is not only good-looking, it’s ultra-tough construction that is much stronger than conventional luggage. Outside and in it’s equipped with functional details to make travel easier. 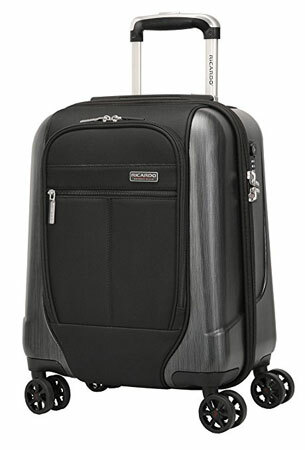 The Ricardo Beverly Hills Ocean Drive luggage is a hardside spinner that comes in three modern colors, sandstone (gold), black, and silver. The exterior is a shiny textured polycarbonate outer shell, that’s durable and easy to clean. It comes in a variety of sizes but we are reviewing the carry-on size. 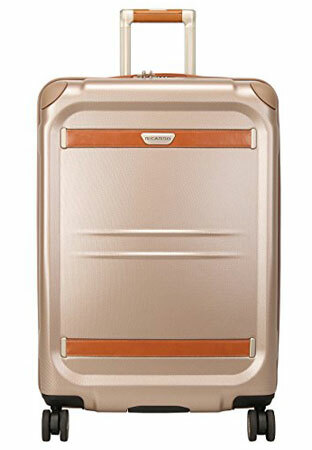 This suitcase has a comfortable handle system that’s constructed of camel colored vegan leather and lightweight aluminum tubes that promote optimal comfort. The degree double wheel system smoothly glides in any direction so you can maneuver through the airport effortlessly. Ultimate protection is also an perk on this bag with travel sentry approved locks to protect belongings and allow the TSA to screen checked bags faster. Inside we have excellently organized functional storage with two compartments. A unique zippered divider pocket separates packed items for easy access and organization. Adjustable tie-down panels keep personal belongings in place. A favorite feature of mine is the built-in suiter loop and adjustable anti-wrinkle bar that protect hanging clothing. You also get a ever convenient removable water resistant pouch, so can separate wet items from the rest of your bags’ contents. 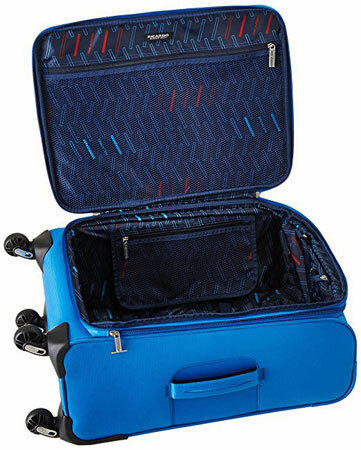 You can travel in style with this attractive and durable luggage from Ricardo Beverly Hills. This would make an excellent gift for loved ones who travel frequently. It’s definitely gender neutral, so it’s a fine choice for ladies and gentlemen. 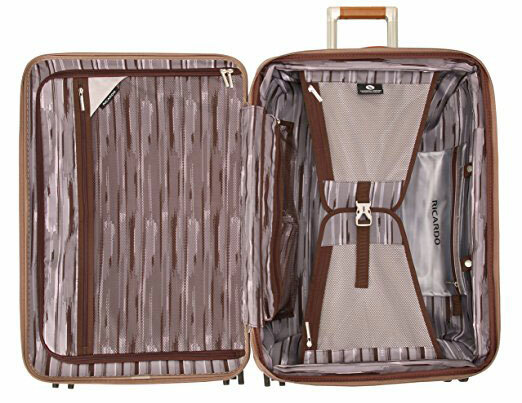 This Ricardo Beverly Hills Mar Vista carry-on is a more traditional strait-forward design with a great reputation. This is bag is a practical choice for a conventional traveler. The Ricardo Beverly Hills Mar Vista carry-on has a classic look and practical features. Well constructed from flexible and soft Terylene Polyeste this bag is sure to endure through regular travel. Four upright spinner dual wheels spin quietly and responsively in any direction. The reinforced carry handles are padded for extra comfort along with multi-stage locking retractable handles that adjust to the height most comfortable for you. 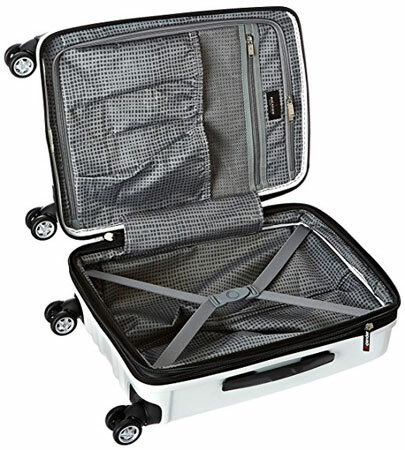 The case also expands with the pull of a zipper to instantly increase packing capacity. Two outside pockets are conveniently placed for easily accessed exterior storage. Interiorly it’s fit with a mesh zippered pocket, another small pocket in the main compartment, and tie down straps to keep everything tidy. 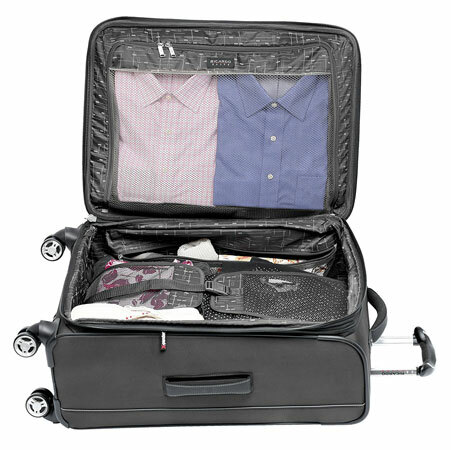 The Ricardo luggage also has a built-in suit loop and adjustable anti-wrinkle bar that protect hanging clothing. Overall this is a functional, durable bag that’s sure to be a reliable travel companion. It’s got an excellent reputation for quality and it also equipped with a limited 10 year warranty. I’d say that makes it a smart buy! This is the little sister of the above Ricardo Beverly Hills Beverly Hills Mar Vista 2 Wheeled Tote made of the same quality flexible material, just in a smaller body. This is a great tote for a day trip or as a personal item, since it fits under an airplane seat. The Ricardo Beverly Hills Mar Vista Tote is made from flexible soft Terylene Polyester. It’s so convenient that this little bag has two in-line skate wheels that roll smoothly and easily. Ladies love the purple paisley pattern, but it also comes in black. A padded electronics sleeve stores and protects your laptop or other device (up to 15.5″). A large front pocket with multiple pouches is provided to help keep your belongings organized. A retractable handle system adjusts to the perfect height for you, while an ergonomically designed handle with a textured TPR grip provide extra comfort as you pull your case. Essentials can be easily packed in a large main compartment, and lots of small pockets inside help keep even little things tidy and organized. Like it’s big brother this tote also comes with a 10 Year limited warranty. This tote is also sure to be a reliable travel companion, and would be nice as a member of a set. This is splendid gift for a lady or gentleman. Looks like it would even great for teachers and business use. With the 10 year warranty, it’s a wise buy. To put it simply this is a really cool looking bag. They call it a hybrid. The Ricardo Beverly Hills Mulholland Drive 17″ is sort of a combo of a hardside case and the traditional soft shell as it’s constructed from a micro ballistic nylon polycarbonate alloy shell with a luxurious brushed finish and micro ballistic nylon. 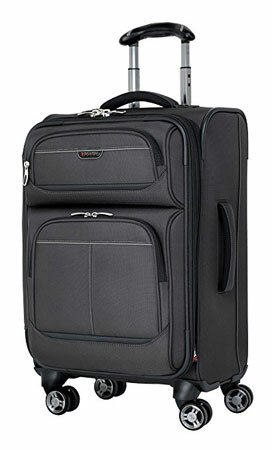 This Ricardo Beverly Hills Mulholland Drive carry-on is 17″ and expandable. This is a good choice if you want something smaller than the usual 21″ carry-on. It’s a very lightweight bag at only 6 lbs. 4 oz. The marriage of hard and soft material that make up the exterior of this bag appears to be very well crafted for long term use. The zippers are smooth gliding and also appear quality. Four 360 degree dual spinner wheels roll smooth and quiet. A push button handle extends in three sections to adjust to your height. A TSA compliant combination lock is built into the hard side material to keep your goods safe and secure. 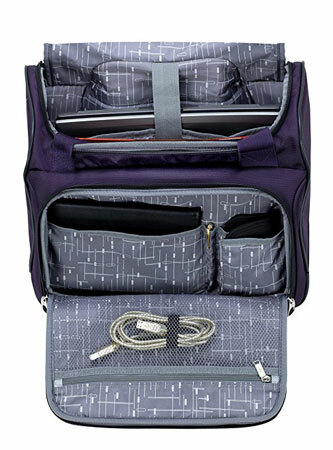 Organization is easy with the inside and outside zippered compartments. Inside we have excellently organized functional storage with two compartments. Adjustable tie-down panels keep personal belongings in place. You also get a ever convenient removable water resistant pouch, so can separate wet items from everything else. This hybrid is an affordable carry-on with an unique expensive look. As with most luggage from Ricardo Beverly Hills this bag also comes with a 10 year limited warranty. 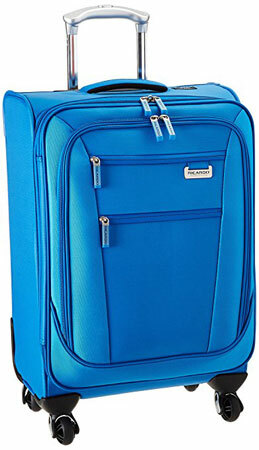 I am a fan of this Ricardo Beverly Hills Topanga Canyon 20-Inch Expandable carry-on. The simplistic textured exterior has a modern clean look. Interior organization would be easy with more than the usual pockets. On top of that this bag is ultra lightweight and made to last. The Ricardo Beverly Hills Topanga Canyon Carry-On is a classy piece of luggage with a simplistic contemporary look. It’s polypropylene hardcase is built to be ultra-lightweight and durable. Whatever mother nature throws at this case, it will likely prevail because of the durable water repellent, puncture resistant exterior. With this bag the damage is sure to be little to none. Well-crafted reinforced corners are smartly designed to minimize any impact at typical stress points. Spinning wheels take the pressure off your body and glide multi-directional to insure easier maneuverability. A sturdy telescoping upright handle is included for ease of movement as well as a handy top handle. This bag is also equipped with a fully-lined interior. Handy adjustable compression straps secure clothing soundly. Inside there are pockets, pockets pockets. A larger fabric zippered pocket excellent for keeping items organized, along 1 large mesh pocket. Also include are a few of elastic-top shoe pockets. It’s super roomy with plenty of space for a weekend trip. If packed carefully it could even suit you for a longer trip. And again it has a 10 Year limited warranty. 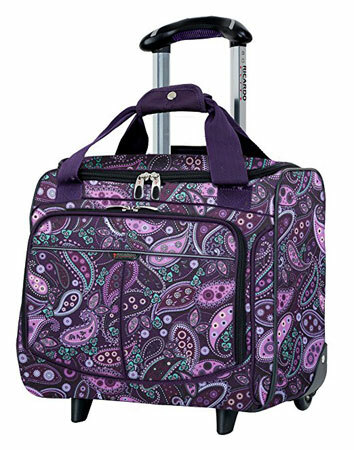 This carry-on has an uncomplicated design and is quality crafted for extended durability. It’s beautiful clean white exterior is gender neutral and would be a well appreciated gift for a loved one or yourself. Imperial is a good adjective to describe this Ricardo Beverly Hills Imperial 20″ Expandable carry-on. It has a that vibe on a silky, elegant, Asian garment. It’s also very lightweight at only 5 lbs, 14 oz. 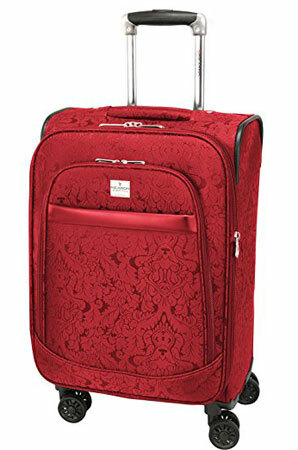 This posh Ricardo Beverly Hills Imperial carry-on looks quite luxurious and elegant. The silky looking exterior is made from 100% polyester jacquard making it lightweight and durable. It comes in a bright crimson red, and black. This expandable has an 8-wheel 360 degree spinner wheel system that glides with fluidity and is easy to maneuver. The retractable handle system has an ergonomic push-button locking handle that adjust to your preferred height. The Innovative cushioned top and side carry handle design is incredibly lightweight yet extremely durable. Interiorly this beauty has a luxurious padded lining and multiple accessory pockets to pack your personal items. Two elastic pockets are ideal for packing shoes and other items. 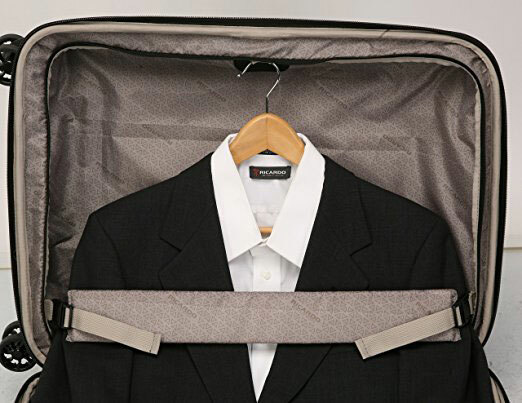 Adjustable tie-down straps are provided as usual, to help keep items safe and secure during travel. A removable zippered organizer pouch is also included. If you’re looking for a bag with a dignified vibe of luxury this is lovely carry-on is a stylish choice. It’s more feminine and has a classic look, so I’d recommend this bag for a mature woman. It would make an excellent gift for a classy, posh grandma, like mine happens to be. 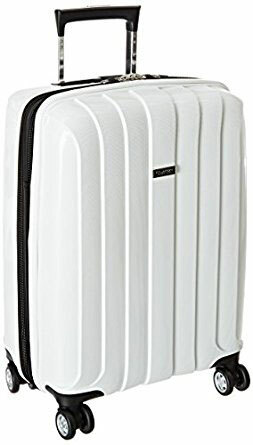 Thoughtfully designed for upscale travel the Ricardo Beverly Hills Del Mar 21″ Expandable carry-on is designed to meet all our travel needs. It’s lightweight, durable and roomy, making it a wise buy. The Ricardo Beverly Hills Del Mara carry-on is a softside case that’s solid color, polyester material that is made to be ultra-lightweight and durable. 360 mobility spinning wheels take the pressure off your body and glide multi-directional to insure easier maneuverability. A sturdy telescoping upright handle is included for ease of movement as well as a handy top handle. Four, yes I said four, exterior pockets are well placed for easy access and large enough to store multiple items. I’d definitely slide in an extra pair of shoes in the largest pocket, in case I need to make a mad dash in the airport because I took too long putting myself back together after the security check. This piece has a fully-lined interior. The inside is deigned simple and practical. Always handy adjustable compression straps secure clothing during travel. A large mesh zippered pocket is provided on the top piece. Also include is a smaller mesh pocket and a dry pocket perfect for separating laundry or toiletries. And again we have a 10 year limited warranty with this carry-on. This practical bag is suitable for any type of travel, and is versatile for men and women. Ricardo Beverly Hills is a company with a good reputation for quality, affordable luggage. And with a 10 year warranty promise, this is a smart buy.